Hey everybody! Happy Wednesday! Before we get into this weeks post, lets recap right quick. 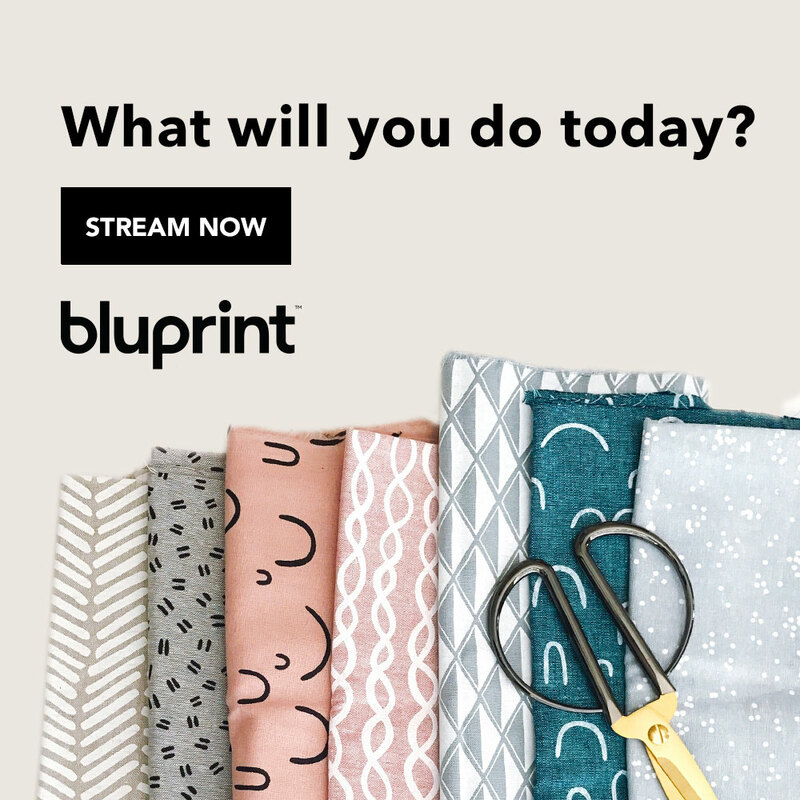 In Week 1 of the Royal Wedding Sew Along, I went through some fabric options and inspiration for Butterick 5850. You can follow the Pinterest board I create for this sew along, and the Pinterest board McCalls created! For Week 2, I went through a couple adjustments I had to make for my bodice muslin! I can't tell you how happy I am that I did one! It really opened my eyes to the small tweaks that can be made to make a pattern fit better! I look forward to making more from now on. Today is my Week 3 post, and we are finally starting to sew our dress! Just so you know, I will be sewing View A of Butterick 5850, and for fabric I've decided to go with a Linen. Why linen you ask? Because I thought about my lifestyle and I know a dress in beautiful linen will get more wear than a dress in special occasion fabric. Now, I'm still deciding on color (lol, so many colors to choose from) but I'm planning to purchase the final fabric this weekend! 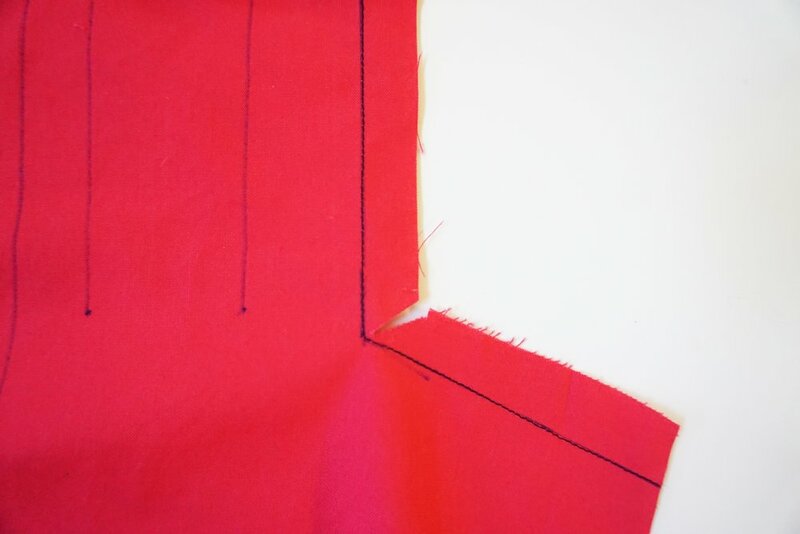 In the mean time, I'm going to use this red cotton to walk through the first steps of the pattern. Before we start, remember to transfer all your lines, and markings. Below you can see I used a marker and non matching thread, thats only so you can clearly see what I'm doing. Be sure to transfer your markings/lines with your fabric marking tool and use coordinating thread. Transfer all of your markings, including the basting lines. You can see that my inner corner lines (where we'll be reinforcing) goes to the top, through the circle and to the side. I usually only do reinforcing stitches like they are indicated on the pattern (pic below), but on the pattern instructions (step 1) you can see the lines are longer. I'll follow the instructions and diagrams for this sew along. Once you have it reinforced, clip to the circle. DON'T clip through it, just clip TO it. Set 2: Lets sew the front darts. Bring the dart legs together and pin in place. To make sure that you're pining through the legs, stick a pin through one leg and check to make sure it went through the dart leg on the other side. 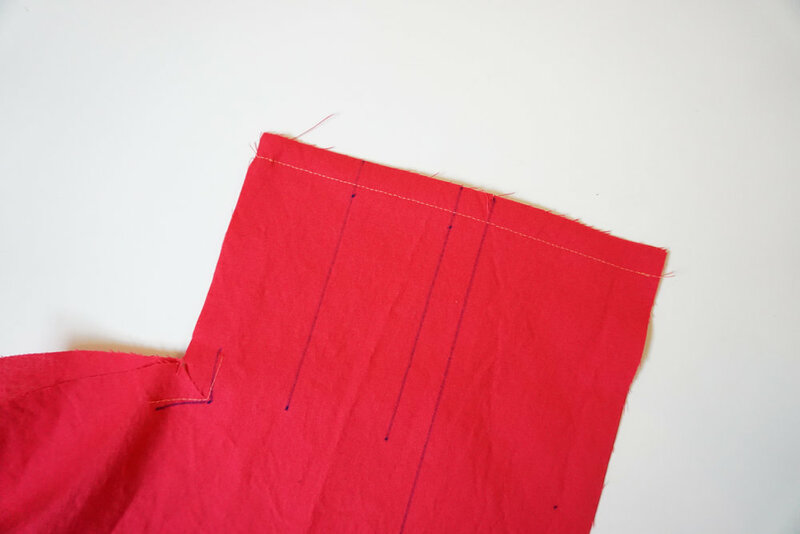 Begin sewing your dart in place from the wide end (side seam) to the point. Backstitch only at the beginning. DO NOT back stitch the point. Simply continue sewing off the garment. Once your dart is sewn, leave a tail of thread at the point. To prevent a bump at the point of your dart, tie the thread tails into a knot and clip the excess thread off. Press your dart down toward the waist. Step 3: Stitch bodice front together RIGHT sides facing at the center back. Open out the seam, and give it a good press. 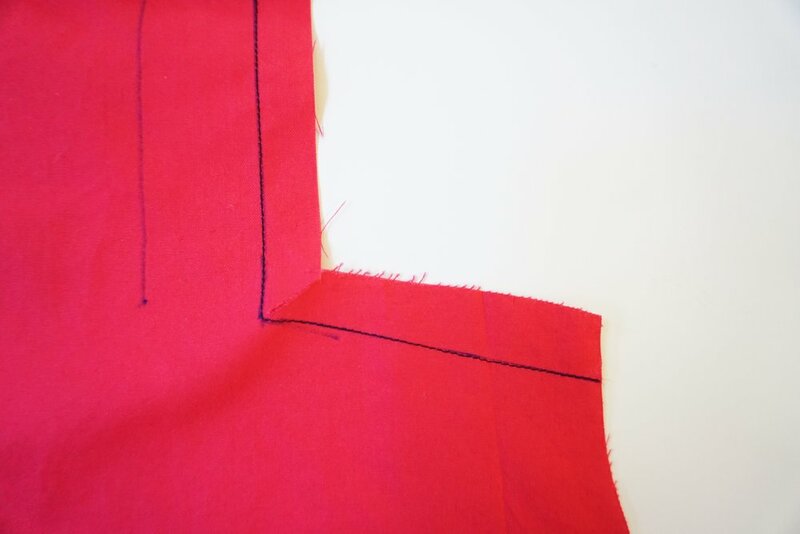 Step 4: Sew an ease stitch at the shoulder seam on the BACK BODICE between the circle and notch. EASESTITCH: stitch along the seamline, using a basting stitch. Pull thread ends when adjusting fit. Step 5: Sew the back darts the same way you sewed the front darts. After they are sewn, press the darts toward the center. Step 6: STAYSTITCH the neckline of the back bodice. Stay-stitching prevents the garment from stretching out while we are constructing it. STAYSTITCH: stitch 1/2" from raw edge. This stitch should be in the seam allowance. We are now through the first steps of sewing our dress! For week 4, we'll be moving on the step 7-11! 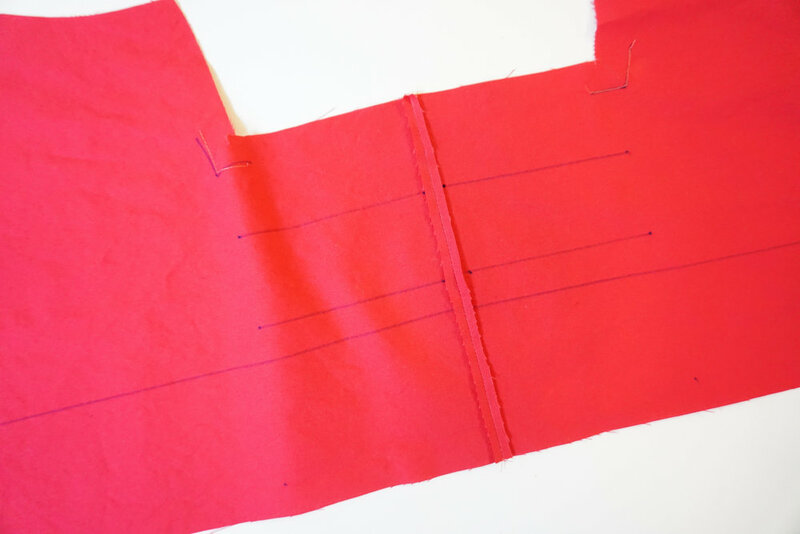 For these steps, we'll be sewing and attaching out lining, and constructing more of our bodice. I'll also upload a video for sewing the complete bodice. I'll still post the steps here in a post, but I want to be able to refer you to the video in case you need a visual for completing some of the steps. If you have any questions, leave them for me below, I'll be happy to answer. Be sure to use #royalweddingsewalong to share your photos social and join the Royal Wedding Facebook group. Lots of inspiration in there from other makers that are participating!